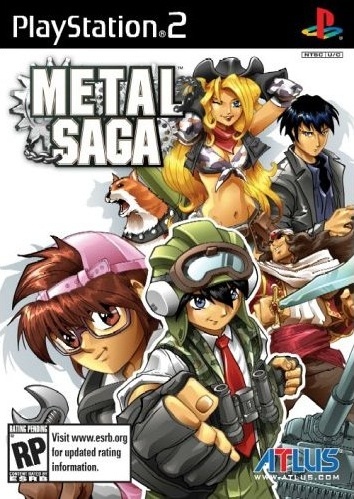 Metal Saga (2005) is part of the Metal Max series, a post-apocalyptic RPG where characters travel the world in tanks, looking for bounties and monsters to fight in caves and ruins. Tanks can be customized by buying and discovering parts. The game also features a dozen endings. The series has for the most part been limited to Japan, but Metal Saga on the PS2 was the first to be released in the US. “Route 99” is the overworld theme that plays when driving around in the tank. It’s a nice acoustic guitar piece with reminisces of R-Type. A fairly long theme, the song has great development , good for illustrating travel over a wide world. The synth line has a bit of cheesy swank to it though, and seems to have some similarities with Kirby. However, the piano break in the middle goes well with the acoustic guitar and is a nice interlude. Metal Saga has another good overworld piece, “Driving to New Fork“, which uses a lovely piano and recorder. The piano piece reminds me a little of “Elec Man” from Mega Man. The track is a little shorter, but very pleasant. Satoshi Kodokura has been responsible the music of the Metal Max games, but is also credited with remixing two Mother 3 albums. This is definitely an excellent tune! It’s somewhat similar to the Terran themes from Starcraft with the steel guitar and synthesizers.